My name is Juan Pablo Noriega Herrera. I am 39 years old and the son of a missionary couple. My father, Gilberto Noriega, and my mother, Ruth Herrera, went to a theological seminary in Guatemala City. I grew up on the mission field. My parents have worked with several churches especially in the area of Christian education with Christian schools. I grew up in my parent’s ministry and with the influence of my maternal grandfather, a pastor and seminary professor. My grandfather took me to many villages that he visited to preach. I loved to listen and learn all that I could from him. He was very kind and very interested in showing me how to teach and to love God’s Word, to work hard, and to have passion for serving our Lord Jesus Christ. At age 13, I met a wonderful man who came to Guatemala with Missionary Ventures to help and support dental care in one of the Christian schools that my dad was working with. His name was Howard L. Lilly Jr., DDS. He was an active member of the MVI Board of Directors. His love and support of many kids in many Christian schools was a blessing and great help through Missionary Ventures. Jack, as everyone called him, took a special interest in me and in my family and taught me to assist him in his dental work every time he came to serve in the Christian schools. He was always teaching me to love to serve in Christian ministry. He was always very interested in my opinions and he loved to argue and talk about Biblical issues. He liked to challenge me in many areas but especially in Biblical things. Dr. Jack decided to help me go to university because my parents were missionaries and their income was not enough to support me in my studies. God used Jack to help and support me to become a medical doctor. Even though Dr. Jack has now passed away, he was such an encouragement in serving the Lord. Because of his example, and my grandparents and grandfather, after I graduated medical school I asked to be sent to Nebaj, Quiche in the mountains of Guatemala, to serve the Ixil Indian people. 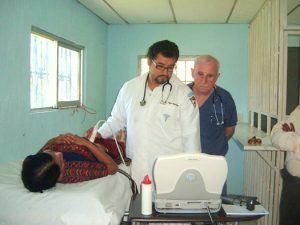 I have now been in Nebaj for 12 years and have been mentored by the MVI Medical Directors in my position at the Hospital Vida y Esperanza that Missionary Ventures started. Their mentoring has helped me to start a school for auxiliary nurses, to plant a church that now has over 70 members, and to open an accredited Bible school for the local pastors and Christian leaders. I am thankful for all that the Lord has done in my life and for all that Missionary Ventures has done in order to support my ministry; working side by side as partners in the service and being co-workers and partners in the greatest thing that humans can do, serving our Lord and Savior Jesus Christ. To Him belongs the Glory. Connect with Juan Pablo on Facebook.